There is something special about baking or cooking for someone on a special occasion/holiday. I have always enjoyed messing around in the kitchen, failing more than succeeding and trying out different recipes. This recipe, however, has always turned out just right and I am excited to share it with everyone! 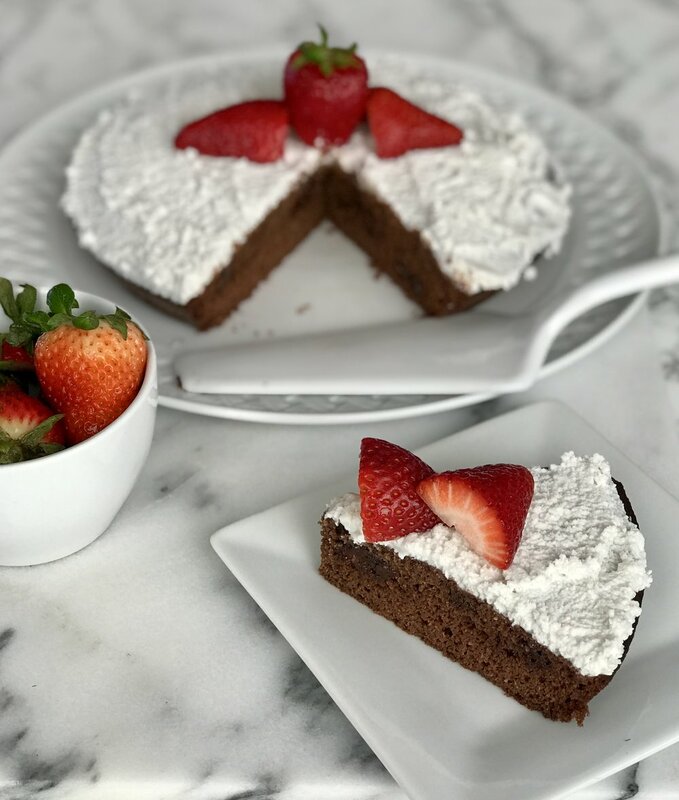 I have been making this chocolate cake recipe for a while now. Its a favorite in our house! You can also turn it into muffins, donuts and bread. You will find that the icing for this cake is the same icing I have used in the past in other recipes. I know people are super busy now-a-days and its easier to buy a cake from a bakery, plus it helps support local businesses. So this cake is for the picky moms, the crazy health nut or the wanna-be baker like myself. It's a super easy recipe and tastes so delicious. There are a ton of variations you can do with this recipe as well and I will do my best to list other options so everyone (vegetarian, keto, paleo, etc.) has an option. The version I made this time is keto/low carb. It contains butter, eggs etc. I will do my best to give you other options in case you do not want to use butter. I don't think a flax egg will work for this recipe. But you can try. * I made one large round cake, but you can use two small round pans and layer the two and put icing in the middle and on top. Or you can use one giant round cake pan and make one large cake or cut ingredients in half and make one small cake etc. (or make muffins, bread). ** Before making this recipe make sure you have placed canned coconut milk in fridge over night so it hardens. Grease the cake pan you are using or whatever pan you are using. Once the eggs, sugar and milk are mixed, add remaining ingredients. Place batter into two round cake dishes or 1 large cake dish (or muffin, donut, loaf pan). Place in oven for 35-45 minutes. All ovens are different so check on cake around 25 minute mark. I always use a knife or toothpick to check the center. Remove from oven and let COMPLETELY COOL. I waited 3 hours after removing from oven before putting icing on it. Make sure the coconut milk has been placed in the fridge overnight. This will only work with full fat canned coconut milk. Open coconut milk from bottom of can and drain out liquid coconut milk into a container for another use (I used it in oats, smoothies etc). Take the hard coconut portion and place in a bowl or blender (if using a hand held mixer) or a Vitamix (I used a Vitamix). Add the stevia and vanilla extract and mix until nice and fluffy like icing. I used a spatula and iced the cake. I added strawberries for a little decoration, feel free to use whatever fruit/toppings you like. You can add more chocolate chips, coconut flakes, melted chocolate etc. Strawberries were a great combo with the chocolate and icing. But, like I said, you can use whatever you like! Store cake in fridge until you are ready to serve. We like to heat it up in the microwave for maybe 5-10 seconds to warm it up and add some ice cream on top! WARNING: if left out or heated the icing will melt. I hope you enjoy this delicious recipe! Its on the healthier side and definitely great for special occasions. 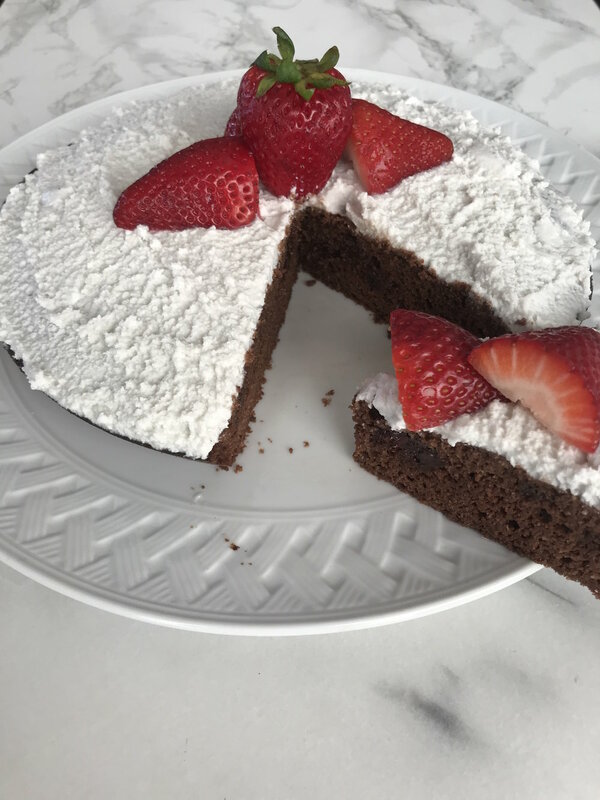 My version is keto/low carb and paleo, but feel free to use whatever sweetener you wish to make it your own unique cake!